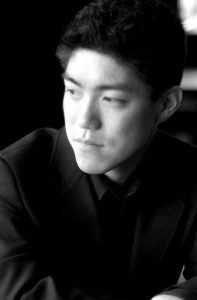 Hailed by the Washington post as “A pianist’s pianist”, Ryo has established himself as one of Canada’s shining artists. His success includes winning the gold medal at the 10th San Antonio International Piano Competition, where he was also given special recognition for a performance of the complete Chopin Ballades. He is also the grand prize winner of the Hugo Kauder International Piano competition and a laureate of the Minnesota International Piano-e-Competition, the Dr. Luis Sigall International Piano competition in Vina del Mar (Chile), and the Hilton Head International Piano Competition. Ryo has made concerto appearances with orchestras around the world including the Vancouver Symphony Orchestra, the Montreal Metropolitan Orchestra, San Antonio Symphony, Minnesota Orchestra, Hartford Symphony Orchestra, the Moroccan Symphony Orchestra, and the Tokyo Kioi Symphonietta. His performances have taken him to such venues as the Kennedy Center, The National Gallery of Art, Library of Congress, Carnegie Hall, Suntory Hall in Tokyo, and Salle Cortot in Paris among others. A recipient of many scholarships and awards, Ryo has been endowed twice by the Canadian Arts Council with a grant as an Emerging Artist, and is a recipient of the Arthur Foote Scholarship from the Harvard Musical Association. He was also awarded the Sony Foundation of America Career Grant through the Salon de Virtuosi of New York, and a Washington Award by the S&R Foundation of Washington DC. He has also been an artist-in-residence of the Maxwell Shepherd Fund of Connecticut. Ryo is also increasingly recognized not only as a performer but as a pedagogue, and is in demand as adjudicator to competitions and as masterclass clinician in North America and Asia. He has also released two solo CDs consisting of works by Chopin and Debussy, as well as a CD in collaboration with the cellist Dai Miyata in Japan. Ryo Yanagitani received his Doctor of Musical Arts degree from the Yale School of Music under Boris Berman, a Bachelor Degree in Piano Performance from the University of British Columbia under Doctor Henri-Paul Sicsic, and an Artist Diploma from the Cleveland Institute under Sergei Babayan. He was an instructor for the Chamber Music Program at Yale, and was a visiting Assistant Professor of Piano at the University of British Columbia in Vancouver. He held the post of Principle Artist-in-residence for S&R Foundation for the past 3 years, and has recently been appointed Artistic Director of the Ryuji Ueno Foundation in Washington DC. The Ryuji Ueno Foundation is a 501(c)(3) non-profit organization founded in 2015, dedicated to supporting excellence in classical music, broadening its relevance to new audiences, and furthering innovation in the arts. The foundation supports individual artists to develop and explore their talent and achieve their full potential through a number of programs, including the Evermay Concert Series, and the Potomac Music Lab.